Boundary fence wall in Abu Dhabi, UAE Boundary Walls by StoneTree® provide protection, privacy and security, enclosing large and small areas alike, while protecting the interior space from intruders. In India, StoneTree® Concrete Wall Systems are currently being used to enclose large industrial sites and SEZ or Special Economic Zones. In parts of the Middle East, StoneTree® Walls enclose and divide large residential, commercial and industrial areas. 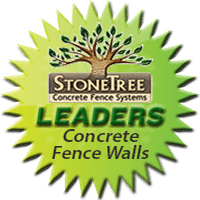 StoneTree® Concrete Wall Systems are the safest, most efficient, cost-effective way to enclose a large area in the shortest amount of time. Due to the efficiency of the StoneTree® System, a crew can install over 500 lineal meters per week, reducing the boundary fence installation time and saving labor and equipment costs. Because of their sheer size, boundary fence walls are generally not decorative in nature, used primarily for boundary delineation and area security fence walls and privacy fence walls. 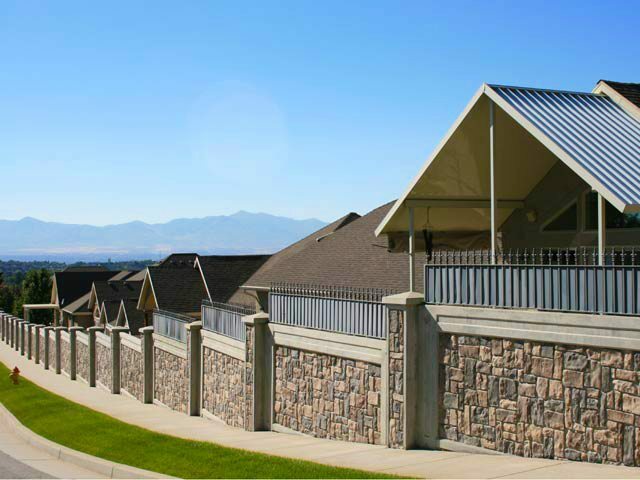 StoneTree® Wall Sections are vertically cast, which ensures that they all have a highly defined, decorative concrete texture in natural-looking stone, brick, block and/or other custom architectural designs on both sides of the wall. StoneTree® Walls are durable, stable and versatile. The combination of StoneTree® Proprietary Combo-Cast™ Technology and Rigid Footing Support produces a wall of superior strength which is able to withstand any number of hazards including fire, water, wind, dust, and seismic conditions. They are also low-maintenance fences, rarely requiring upkeep after the concrete fence installation process.